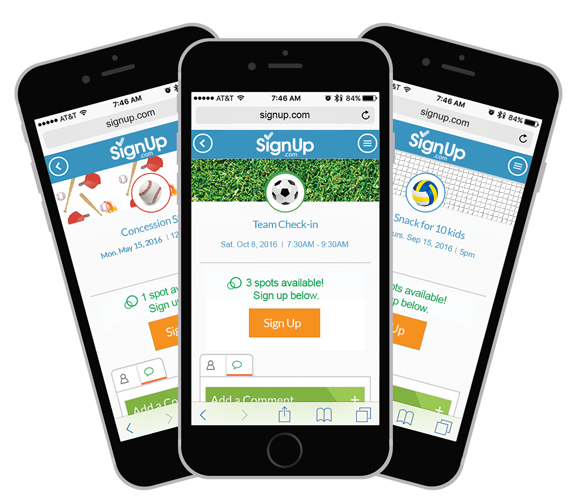 Simplify league planning and boost participation with free online SignUp sheets and volunteer calendars. Save time coordinating concessions, tournament and meet volunteers – set schedules for officials and grounds keepers – and empower team parents and coaches to quickly organize snack schedules, carpools, team parties and more.
" This was the smoothest volunteer SignUp we have ever had for our regional soccer tournament – 150 spots filled in 48 hours! Volunteers loved the reminders and I love how easy it was getting everyone organized. " " Wow! 75 swim parents signed up in 24 hours - your website saved so many phone calls and emails for our summer swim team season. "